Wow, this has been an exciting experience. 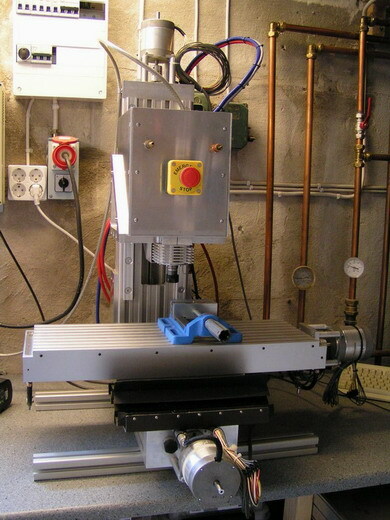 It all started in 1999 when I wanted a machine to automate the drilling process of the PCB's for the various electronic projects I was making. After some brief research I jumped in, head first and after a couple of months I had what can be seen in the photo below. The machine used old ballbearing drawer slides, acme-screws with bronze nuts, and a Dremel as the spindle. I looked for some fairly priced stepperdrives for a long time but eventually decided to build my own based on the L297-298 combo. Looking back on the whole project the drives was probably the best part of the whole machine. If interested you can download the schematics etc for that driver. 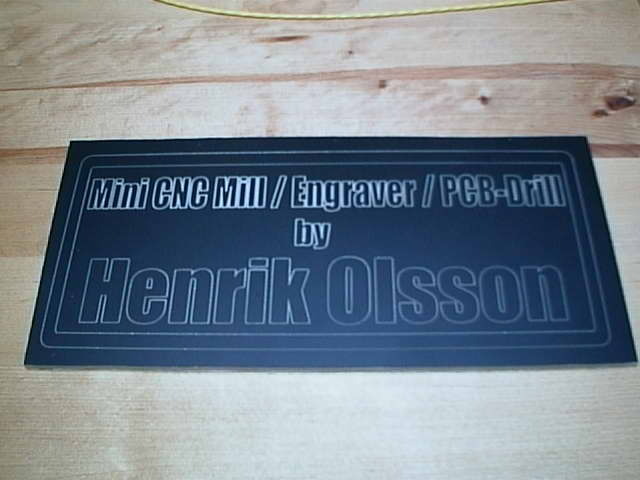 Here's a shot of an engraving I did with the machine. The 'artwork' were made with CorelDraw and the machine was run by a program called Stepster which I believe was one of the very few available PC-CNC programs at the time. (Excluding EMC for linux). The machine did what I first wanted it do but by the time I was finished with it I had come up with so much stuff I wanted to do with it that I immedatly knew I wanted another one. Besides that - I love building stuff. 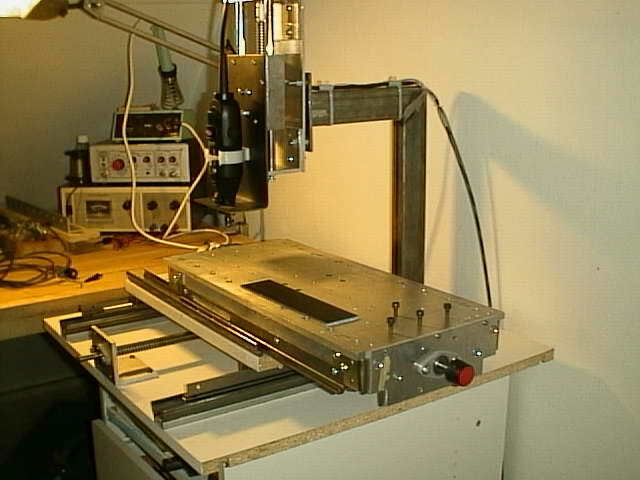 So with a bit more knowledge of what CNC is and with recent (at that time) access to some decent machinery I started the design and manufacturing of this baby. Yet a few years down the road I stumbled across an Abene VHF-3 that was previosuly converted to CNC but was now lacking the control. You can read more about that adventure here.